When it comes to builds, the best of cars tend to run in the best of circles. It came as no surprise that when friend and fabricator Art Bandarian sent me a few photos from his workplace at Rod Emory's famed Porsche shop, the featured car stopped me in my tracks. Rod keeps good company, but it was somewhat of a surprise that the car Art had sent me didn't feature the traditional rear-engined flat-motor setup I had come to expect from the friends Rod usually keeps around. In fact, the car wasn't fitted with a Porsche crest at all. 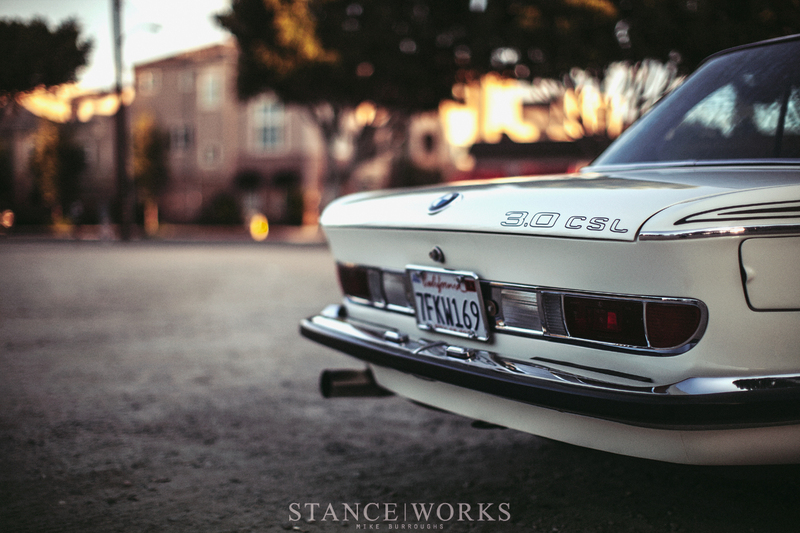 Instead, Art knew me well; attached to his message was Joshua Stern's elegant E9 Coupe. 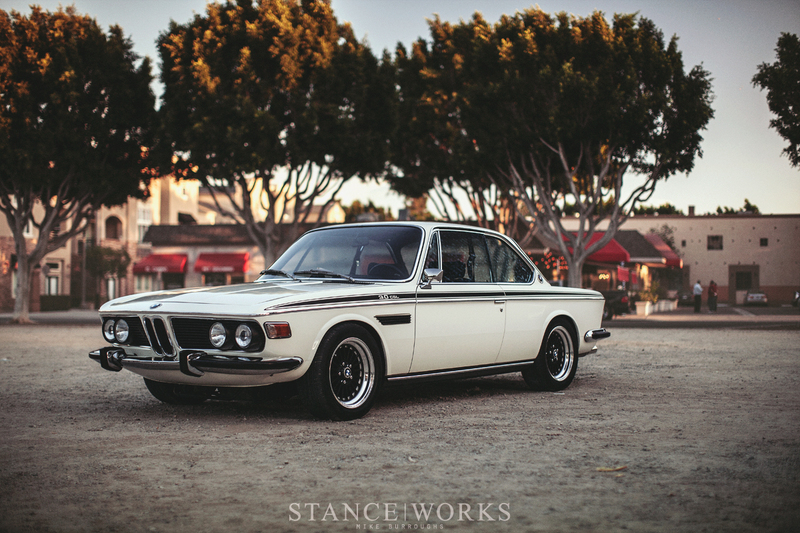 My phone lit up, and thanks to Art, I was met with an E9 that seemed as clean as they come. 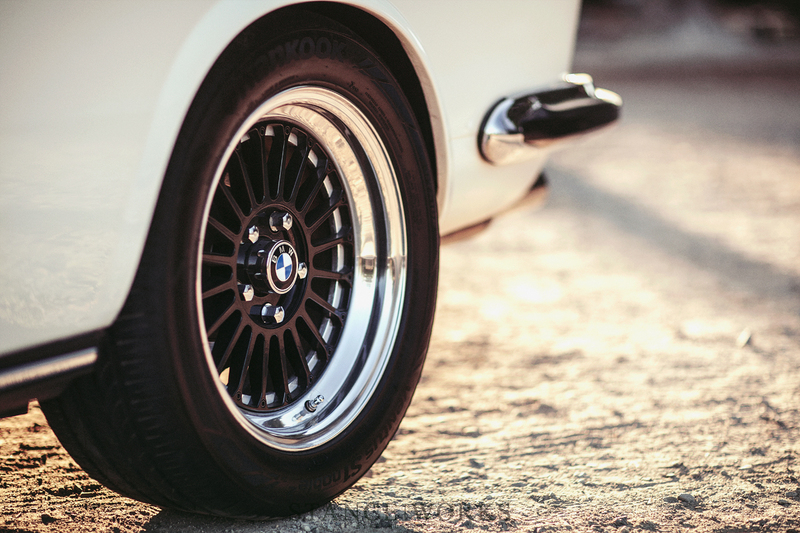 The Chamonix White '73 3.0CS sat atop a set of Weds Bavaria wheels, and its subtle but classic stature left it needing nothing more to pique my interest. However, when Art's second photo arrived, the gravity of the car was much more clearly defined. 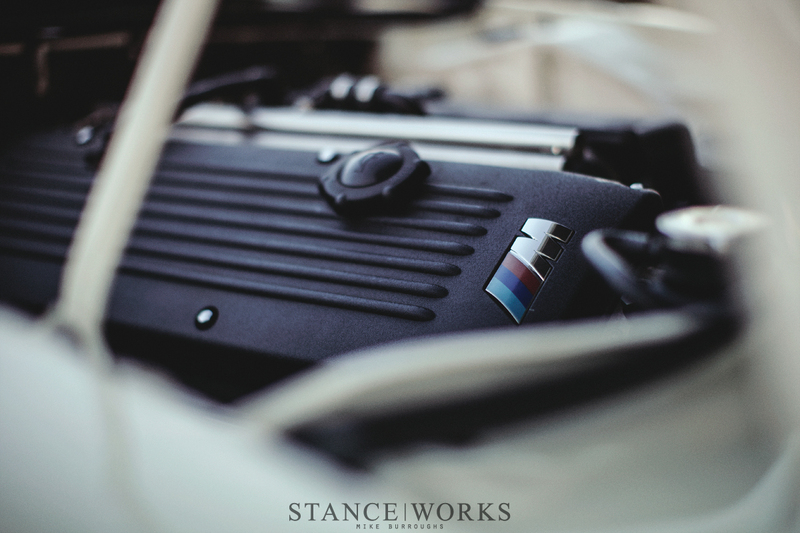 Under the hood, tucked between the tall inner fenders of the E9's bay was an E46 M3's S54 - BMW's crowning achievement in the inline-6 category. The CSL stripes that traced the car's belt line were clearly there for more than just style: they served as a warning. Luck was on my side. 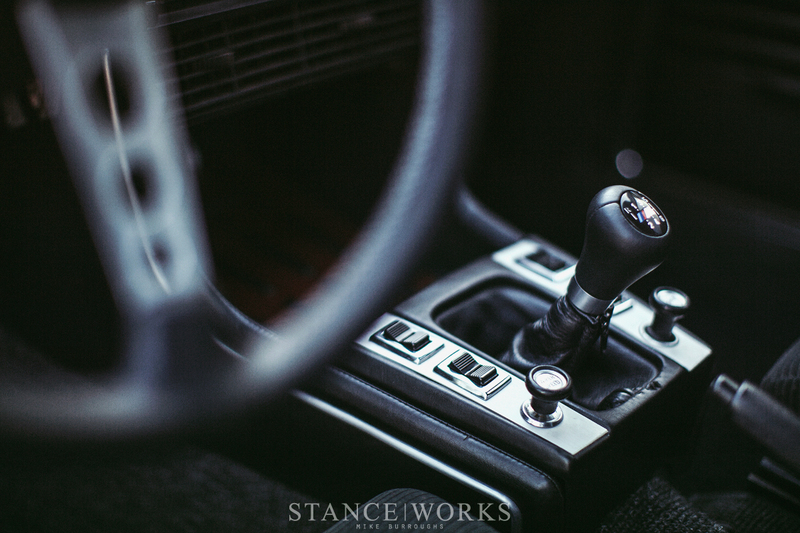 Joshua was familiar with StanceWorks, and fortunately, was just as eager as I was to get together for a shoot. 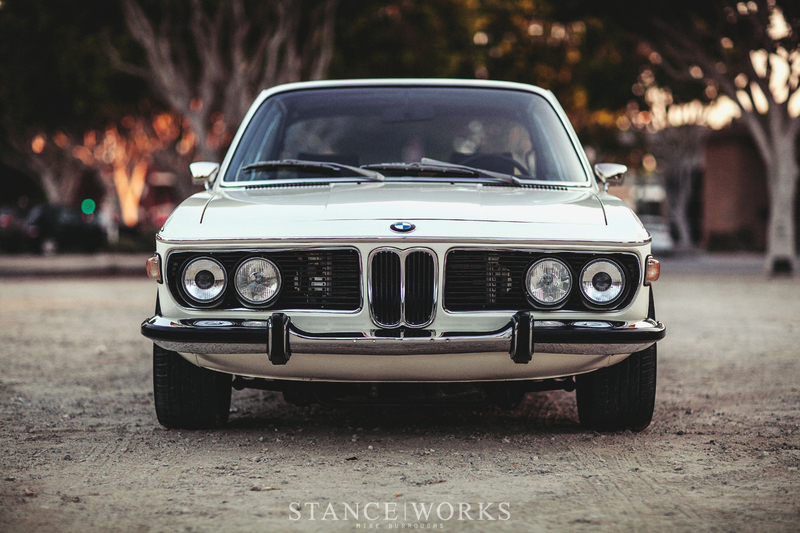 After a week of back-and-forth, we settled on a time, and as the E9 pulled into the lot, every expectation I had for the coupe was surpassed. The quiet downtown streets of Old Tustin served as the perfect backdrop for a classic, dashing car with no bark and all bite. When Joshua arrived, the sun was still perched above the tree line and two-story buildings that surrounded us. I had hoped he wouldn't mind if we killed a few minutes to allow the sun to fall, but as a gaffer and camera operator in the movie and lighting industry, he was well versed in what makes for the perfect setting. What began as idle shop talk eventually evolved, and Joshua's story began to unfold. As both a California native and the son of a car enthusiast, Joshua insists that his enthusiasm for all things four-wheeled is likely in his blood. His 35 years of life have given him a rather eclectic taste for cars. "Some of my favorites are Toyota FJ45 pickups, the original Saab 900 Turbo, early Mustang Fastbacks, Mercedes Unimogs, 60s Lincoln Continental Convertibles, you name it... If its interesting I probably like it," he tells me. Above all else though, it's the colors of the Bavarian-crested Roundel that run deep in his blood. As a child, his parents drove BMWs, and it didn't take long before word of the cars' prowess reached the rest of the family. 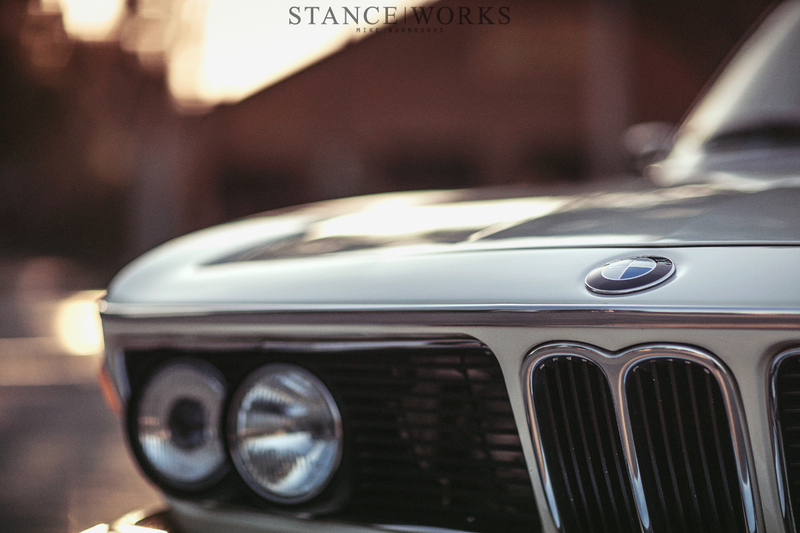 His grandfather, aunt, and uncle all joined the BMW owner's club soon after. It brings some logic to Joshua's collection, which is, by all counts, quite enviable. More than a dozen E9 coupes and E3 "Bavaria" sedans take up space in Josh's shop, as well as an '89 J-Stock M3 race car, an '88 M3 road car, a '91 M5, and a '91 850CI. When it comes to cars not of the BMW marque, Joshua owns a '73 Porsche 911E, an '85 Toyota FJ60, and a 2014 Porsche Cayenne Diesel to tow any of the above, as needed. The sun finally fell in to position, and after Josh positioned the car, the shoot was finally underway. With one-on-one time with the car, I had the chance to look over every detail. 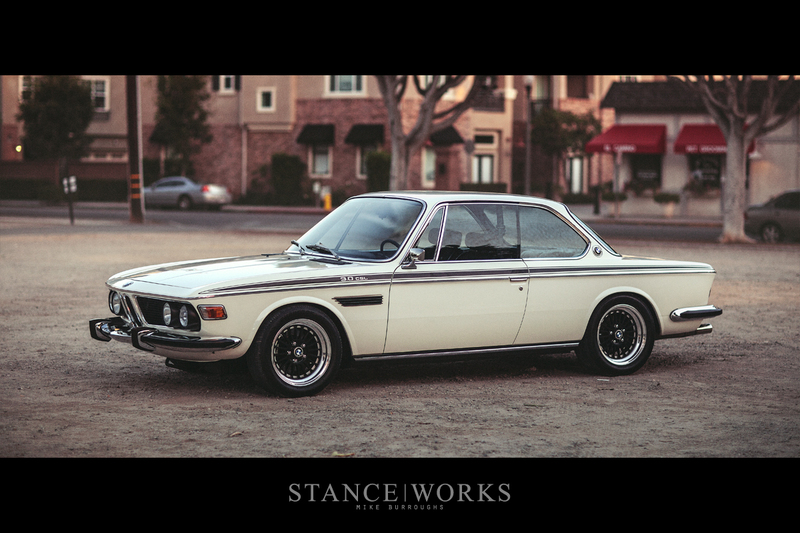 At face value, Joshua's build is under-stated; the exterior doesn't scream "performance," and the lack of a CSL front air dam furthers that idea. Only a few subtle details hint as to what lies beneath the surface. The Weds Bavaria wheels are the only glaringly obvious "not-stock" parts on the car. Keen eyes may spot the E34 ellipsoid headlights, and petrol heads will likely notice the large exhaust hanging under the rear bodywork. Otherwise, the 3.0CS exudes all of the grace a factory E9 chassis is known for. Achieving such a presence was no simple task. 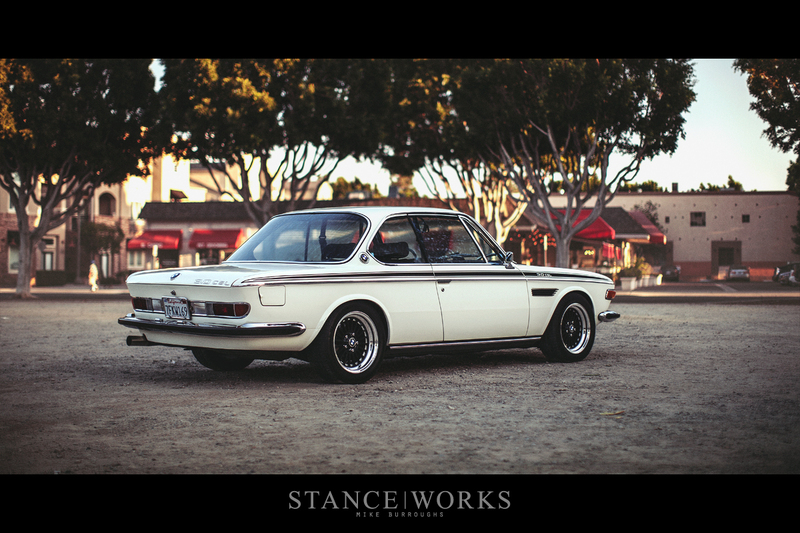 The E9 underwent a full restoration, with the body having been taken down to the bare metal. Joshua points out that upon buying the car, which was originally in very roughshape, he considered a number of color options, such as Sakhir Orange and Phoenix Yellow, but it was the classic shade of Chamonix white that won over the others. After John Esposito's Body Shop tackled the bodywork, the car went to Tighe Productions to be built. It's clear that it's the subtleties that Joshua enjoys most. In fact, the detail work goes beyond most, leaving a lasting impression after Joshua pointed out the changes made as I moved to the car's interior. 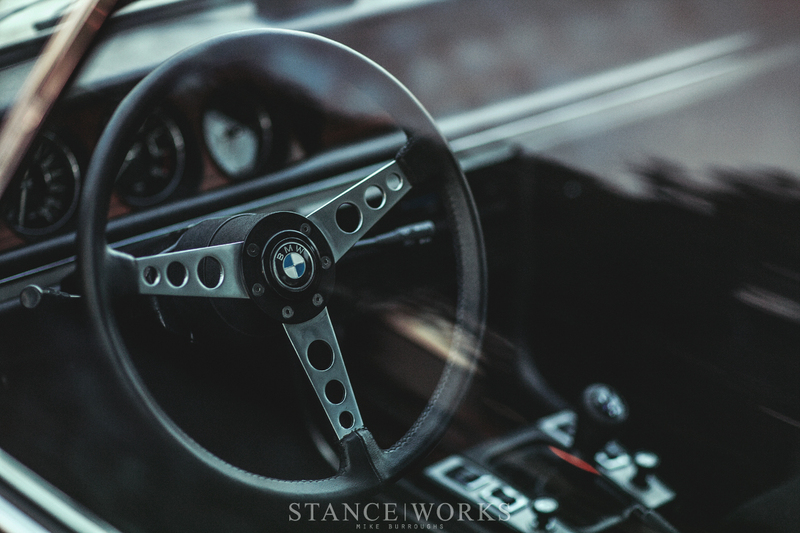 Inside, an original CSL interior was sourced and restored. 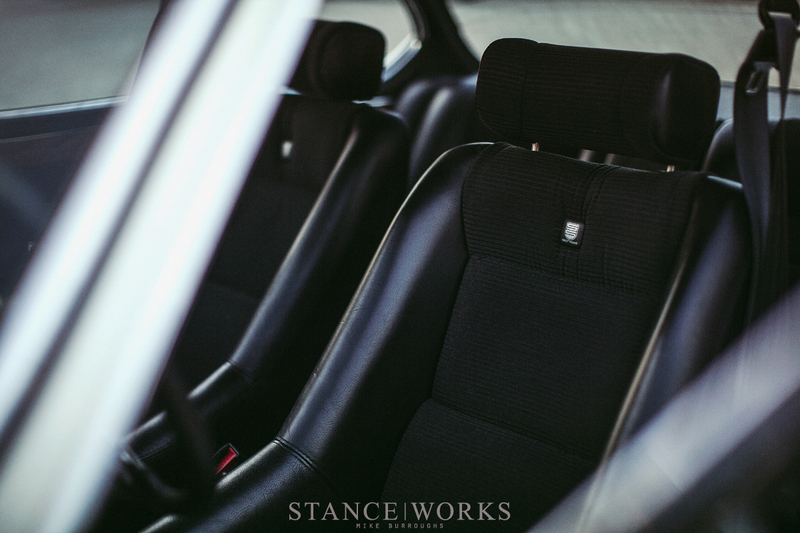 Scheel seats in black leather and corduroy are situated as the centerpiece of the interior, with Italian black walnut trim tracing the outer bounds of inside. 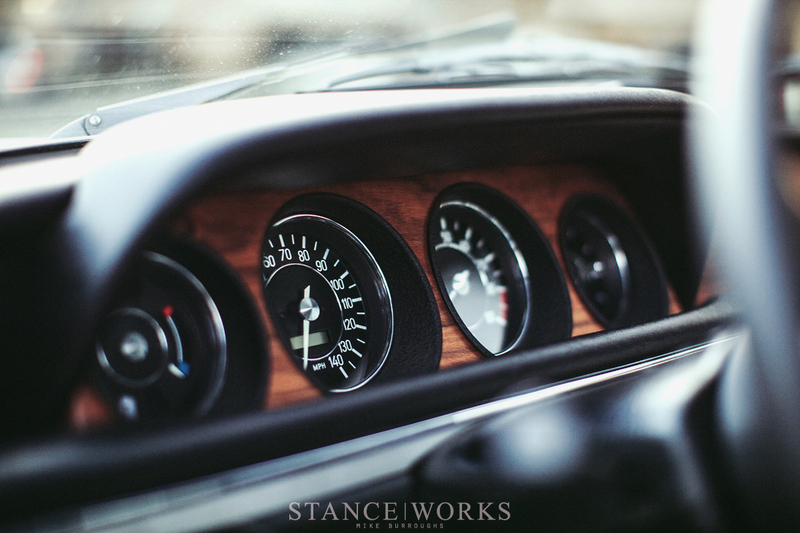 Following the wood trim brings the eyes to the dashboard, which presents some of my favorite details of the car. Fitted within the factory gauge bezels, the tachometer has been corrected to read out the appropriate RPM and redline to match the S54's high output. A GPS-driven speedometer matches, allowing for a speed readout despite absence of the S54's complicated wheelspeed sensor system. Continuing with the detail work, Joshua had the door-mounted ash trays removed, which simplified the door cards to fit the minimalistic theme. A CSL package tray and a stealth-mounted rear-AC system were both fitted to complete the interior. Under the hood is where most will find that their heart begins to race. Joshua had initial plans of swapping in a V10 and 6-speed sourced from a wrecked E60 M5, but after driving the car in stock form, he knew that an inline-six was the only suitable option. Wanting the best of the best, the E46 M3's S54 was the answer. 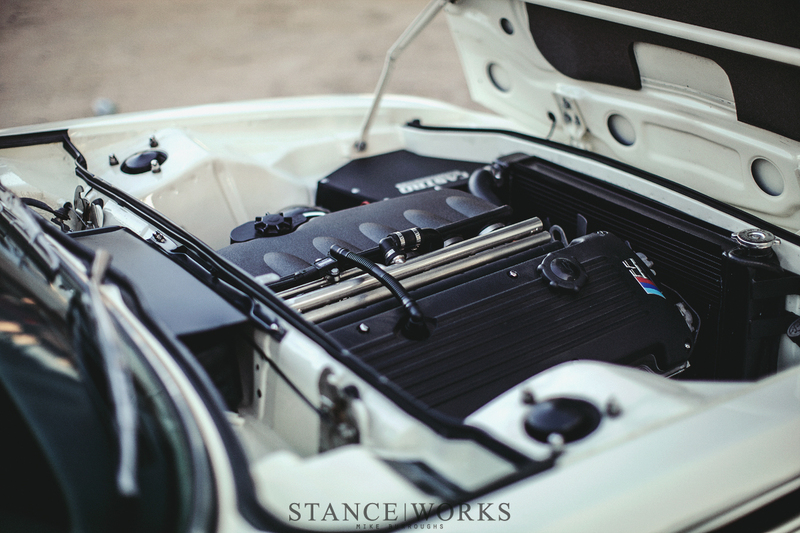 Shoehorned under the hood, the S54 looks right at home in an otherwise shaved engine bay. The engine is mated to the factory 6-speed transmission and routed out through a limited slip differential sourced from a CSL. Jordan at RKTunes modified the car's software to E46 CSL-spec, giving the car lineage-correct power, and the team at Castro Motorsport built a suited intake and exhaust. The car's running gear was built to match: custom front coilovers and swaybars keep the couple handling well, and the E46 competition package brakes provide some balanced "stop" to the "go." Yes please! Let me know when he’s selling her. It’s just ideal in every respect! Beautiful shots of a brilliant build. Congratulations on rendering Chamonix properly. Most photos overexpose it so it ends up looking brilliant white, which it is not.